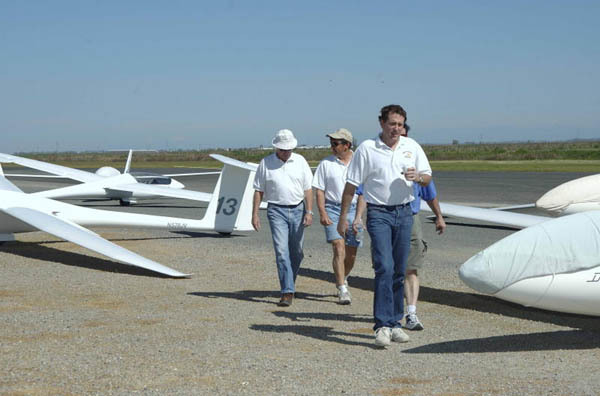 Here are some great photos taken on the field by Tom on a fun flying day in March 2005. Tom really has a knack for taking some great photos, as we all know. Go to this link to see the album…. http://www.valleysoaring.net/pk/05-march/ Photos will open in a new window- either click “back” or close the window to return to these VSA Pages. Start at the top and click on the first photo, then use the arrows above the photos to view the photos one at a time. It starts off with Jim Darke taking family for a ride in the ASK21 and then Tom captures Jim and I talking as we lean against the wing ( I hardly recognized myself, wearing that straw hat!) Nice shots of JJ, Bob Ireland and Cindy later on as well. See the kids – back when they were kids. Rick and Kat were showing their little girl around that day. Check it all out! This was a special day in many regards. The photos sure bring back the memories. It was the end of an era as we said good-bye to Phil Henry who had been the President of VSA for the preceding three years. I presented Phil with a gold watch to thank him for his service to VSA and to commemorate his passage. The watch was a pocket watch type with a fob and a flip open cover that had an eagle embossed on the face of it (a special pocket watch that I had purchased on Canal St in NYC).